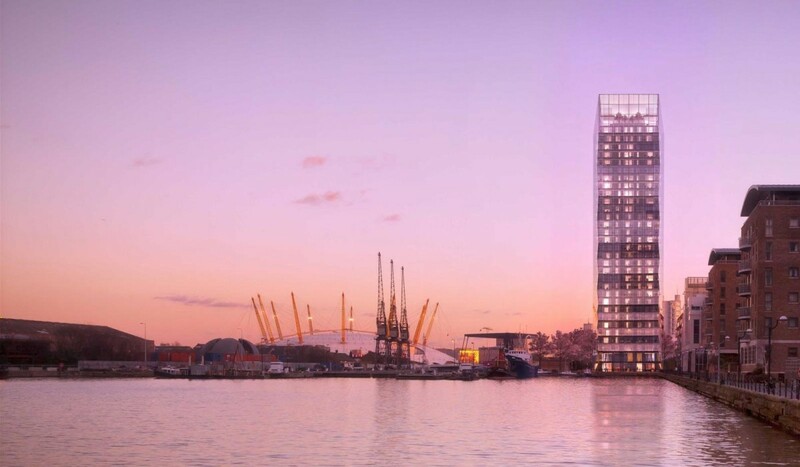 Simpson Haugh’s Dollar Bay tower in the Docklands, in close proximity to Canary Wharf, enriches the area with an exciting and exemplar residential building with a stunning crystalline ventilated façade. Accommodating 121 apartments and retail space, the project consists of a duo of crystalline pillars closely paralleling each other; two perfectly balanced crystals from the water’s edge. The façades are important components in creating a distinctive urban community employing exemplary architectural styles that enhance the overall contextual setting. The design of the façades embrace important performance related matters such as acoustic and atmospheric pollution within this environment. The building envelope is formed by a unitised curtain wall to the north and south elevations and winter gardens with internal sliding doors; the west and east façades are clad in operable horizontal glass louvres. The east façade faces the O2 Arena while on the west façade, which faces the dock, the louvres incline both inwards and outwards to create a cascading waterfall effect. This method gives the building a distinctive image and is reference to a cascade of water, speeding as it falls, as a response to the context of axial foreground of dock water. The alternating folds provide differing reflections of either sky or water. The north and south façades have integrated insulated solid panels with minimal double glazed full height windows providing slot windows to the mainly solid façades. These façades are clad in unitised SSG cladding system finished with a white dot matrix to reinforce the overall crystalline form with an opalescent emphasis to the thinner north and south elevations. Wintech worked with the developers, a joint partnership between Mount Anvil and One Housing Group, to apply building envelope expertise to Dollar Bay, designed by Simpson Haugh Architects. Wintech have a clear understanding of the many factors that affect the quality and performance of the façades and their commercial impact on a project; consultants are appointed to successfully deal with many of the complex design issues to aid the procurement process and to reduce cost and risk. 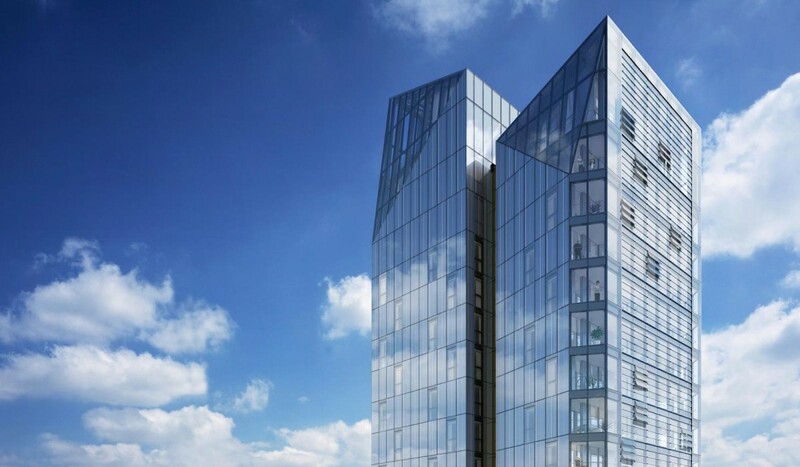 Design elements include the glass curtain wall, structural glazing, rainscreen cladding and winter gardens. Dollar Bay was completed in 2017.